Huddersfield has for many years been a major manufacturing and distribution centre. Huddersfield was at the centre of the textile trade years ago and has many manufacturing and distribution facilities in and around the town. Warehouse storage solutions have been providing bespoke pallet racking solutions to customers based in the Huddersfield and Holmfirth area for many years. Our solutions are innovative, cost effective and bespoke to every client pallet racking. In addition to pallet racking in Huddersfield our sales and service team are easily able to cover requirements of customers in Huddersfield and Holmfirth from our nearby base in Yorkshire. Our sales teams and engineers are highly skilled specialists in providing state of the art solutions to make the best use of the current facilities you have before taking the decision whether to relocate or extend current premises. For many businesses relocating is a hugely expensive exercise and extending can be very disruptive indeed so finding innovative ways to improve your existing capacity can be very cost effective. We always seek to get you the best possible and most cost effective solution for your business. Why Choose Warehouse Storage Solutions? Working with us is made as easy as possible as we can take ownership for the design delivery and completion of the entire project from start to completion, project managing to fit in with your deadlines and within agreed budget. Our portfolio shows us dealing with a wide range of different clients from small installations & mezzanine floors through to major Global players with gigantic warehouse & distribution centres. Our philosophy is a simple one, use the best possible components for the job, have an infinite attention to detail offer clients free quotations and be easy to deal with, just some of the reasons why most of our work comes from referrals from satisfied customers. Warehouse Storage Solutions offer a wide range of options. We offer customers innovative pallet racking solutions that are designed entirely upon your specific requirements. 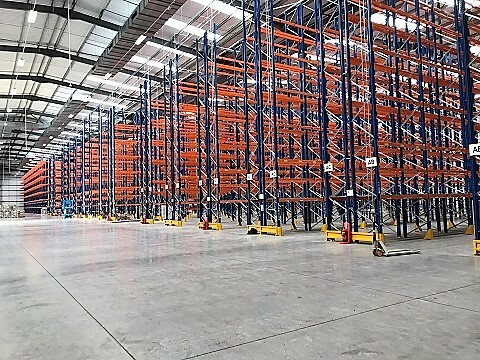 This is the most common type of pallet racking in the UK, being very versatile and with the ability to be built in a wide range of configurations. Your storage space can be maximised even when allowing for differing heights in buildings. This system uses wide aisles to give easy access for people and fork lift operators. Looking for bulk storage? push back pallet racking may very well be your best option. Pallets are loaded onto rails this then pushes the other pallets back up to a maximum depth of 6 pallets. By doubling the depth of the pallets you can double your storage capacity in one simple to fit pallet racking solution. You may need to use specialist handling equipment such as Fork lift trucks with telescopic arms but most clients find this system a really cost effective alternative. For the storage or distribution of high volume or fast moving goods or products where stock rotation is critical then live pallet Racking solutions are the best option. The Pallets are on rollers which are slightly inclined allowing gravity to move the pallets through the distribution area fro start to end. If you need dense storage then this option works well. It needs specialist handling equipment but maximises the amount you goods you can store, yet another highly cost effective solution. As simple as it sounds, fork lift trucks enter the storage lane making the most out of both the floor space and the available height. Perfect solution for outdoor storage such as garden centres, chemical storage or steel stock holders. This could be designed for the UK! the actual Pallet racking is manufactured and then undergoes a galvanising process to make it weather proof. You may be needing some help in considering a move or what to do in order to get the best out of your existing storage space, relocate, extend or re configure ? Call Warehouse storage solutions, your local experts today, we are happy to come and look at all options and advise on the best course. We offer no obligation quotations and are highly responsive. Call us today on 01423 819 057, or fill out the contact form on the website, we will do the rest!